I joined Studio 30 Art Club in 2016, and I had my first art show with the club. Joining the club was the best decision I’ve had since I decided to pursue my career as an artist. I’ve learned so much from the club members and demonstrators. I have been a member of Studio 30 for over 15 years. Throughout those years, I have become more confident, more skilled and have made some lasting friendships. The club offers interesting and informative demonstrations, guest speakers and fun project nights. Being a small club, most members get involved with tasks and this creates a harmonious atmosphere within the club. I’ve moved around a lot over my life as an artist, and one of the things I love is that no matter where you are, you can find your “community”: a group of people who love to create! Studio 30 became my community shortly after I relocated to Victoria and remains a big part of my growth as an artist. I appreciate the fellowship of the artists, and the quality of demonstrators Studio 30 brings in for all to learn from and enjoy. If you are new to art, or new to Victoria, Studio 30 is an ideal group for you! 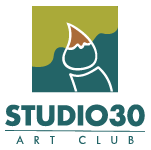 Studio 30 is a very casual group of like artists who get together once a week to socialize, share ideas and listen to an artist guest speaker. Many ideas come from these meetings and give us all inspiration to try new techniques and grow as artists. It has given me the confidence to move forward on this artistic journey and I have made wonderful friends along the way. I have been a member of Studio 30 Art Club for over 15 years, and it has greatly shaped my journey from a timid new painter to an experienced artist. I have learned from and been inspired by outstanding guest speakers/ demonstrators, become confident about showing and selling my work, and made close friends who share my art interests. The group is small, friendly and encouraging for both emerging and seasoned artists.